Draper Plumbing has you covered! Give us a call for all your plumbing needs! Commercial & Residential • Large or Small Jobs we have you covered! Tim Draper started plumbing as a summer job after his freshman year of high school at the suggestion of friends of his parents who thought he might like it. And, he just kept doing it all these years. Now his company, Draper Plumbing, is celebrating twenty years in business! Tim holds a Master Plumber and Gas Fitter license and every staff member at the company focuses on training. 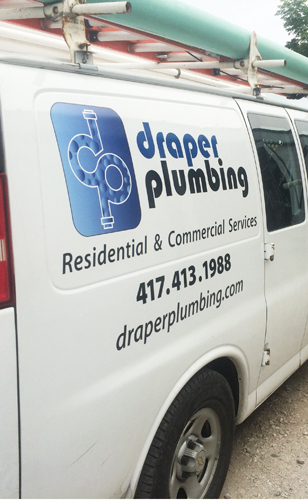 Draper Plumbing services the Springfield area and surrounding communities as far as Bolivar, Monett, Ava and Lebanon handling plumbing needs from new construction and remodeling to repairs and service. Some specialty services include water softener installation and repair, gas grill installation, gas log installation, backflow testing, water treatment, and drain cleaning just to name a few.